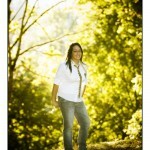 These are some of my favorites from Aileen’s senior portrait session. I just shot these about a week ago down in my neck of the woods in a park and then along the Sellwood shoreline, it is really a great location. These are some of my favorite shots from a senior portrait session of Brianna out on the Clackamas River. I just shot this photo of Jack today and I thought I would share it. He just turned 7 months old on September 22nd and he is anxious to get moving, but not quite sure how to do that.